I spent four days in November at the 2016 national meeting of the United States Conference of Catholic Bishops (USCCB). The meeting is always an enriching experience where I learn a great deal about the Catholic Church throughout our country as well as have the opportunity to meet Bishops who minister in a wide variety of communities throughout our beloved country. A highlight of the USCCB conference took place on Tuesday, November 15, when almost 200 Bishops celebrated Mass at St. Peter Claver Church in West Baltimore with members of that parish and the conference staff. A beautiful Gospel choir enriched the liturgy with prayerful songs of praise. St. Peter’s is a historic Church in the center of a black community that has experienced rising violence in recent months. As Bishops, we joined our prayers with the prayers of so many others who seek peace and reconciliation and unity between peoples of all races, nations and colors. May our loving God hear our prayers! The day before, Msgr. 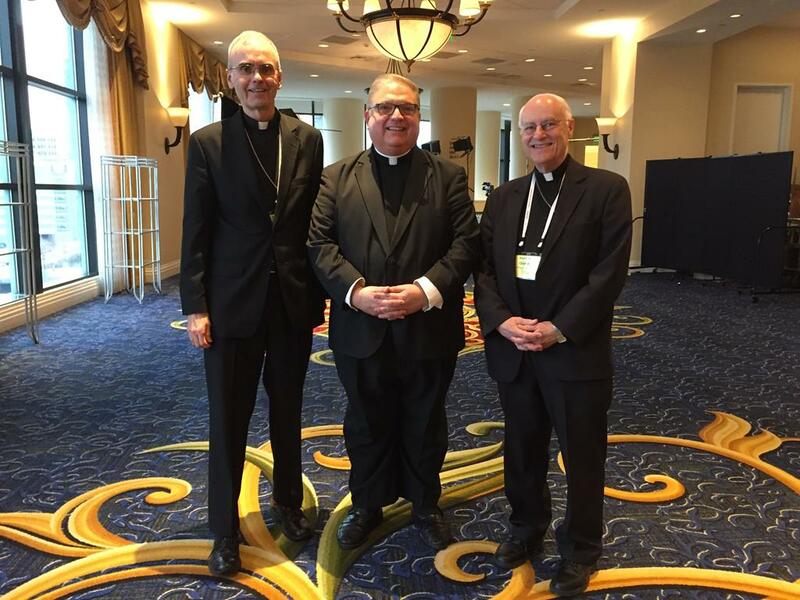 James Vlaun (pictured, center) joined Bishop Raymond Chappetto (right) and me at one of the opening-day sessions. Msgr. Vlaun, as Director of Telecare of the Diocese of Rockville Center, was reporting on the events. The Catholic communications office in Brooklyn and Queens, equivalent to the one Msgr. Vlaun heads up, is Net TV. I invite you to explore the programs offered by Net TV by visiting netny.tv. Their nightly news program “Currents” is broadcast at 7:30 p.m. and 11:30 p.m. and rebroadcast the next morning at 6:30 a.m. on Channel 97 on Time Warner Cable/Spectrum. For further news about the meeting of the United States Bishops, visit catholicnews.com.